her new medication. "I have a serotonin smile." 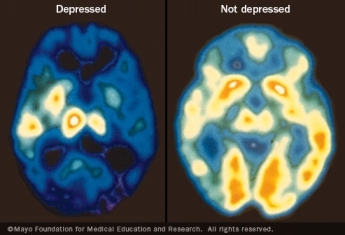 As I posted earlier, Major Depression Disorder (MDD) is serious-you can die from it. A comment posted on my last blog stated psychological pain is just as real as chest pain and should be treated. I concur and am happy to tell you MDD is highly treatable. Lets say you saw your regular medical doctor, started medications 6 weeks ago and you still feel depressed. Now what? At this point psychiatric treatment is the next step. I would obtain your history, review your symptoms and develop a diagnosis with a treatment plan. For MDD, I would start an antidepressant and then discuss psychotherapy goals. The treatment for MDD is an antidepressant and psychotherapy. To do one without the other is a waste of time, plain and simple. Because most of the patients I see haven't done both together, their depression is chronic, everyday for what probably seems like forever. All antidepressants work, it's a matter of using one that alleviates your symptoms and causes no side effects. This is actually easy for me to do. I can usually gauge and see a response within 2 weeks. Antidepressants restore normal brain function, they do not create any artificial states. While we wait for full antidepressant response, psychotherapy is started with goals delineated. For MDD, cognitive behavioral therapy (CBT) is standard. Once better coping skills are learned treatment usually winds down. Yes, for most people treatment ends, you're cured. It is a rare patient in my office who does treatment forever for MDD. Usually a year, give or take, is all it takes. Amazing huh? The comment from my last post has it right, ditch any stigma about shrinks and get better.